Simona Halep’s fashion is different to that of most of her competitors. 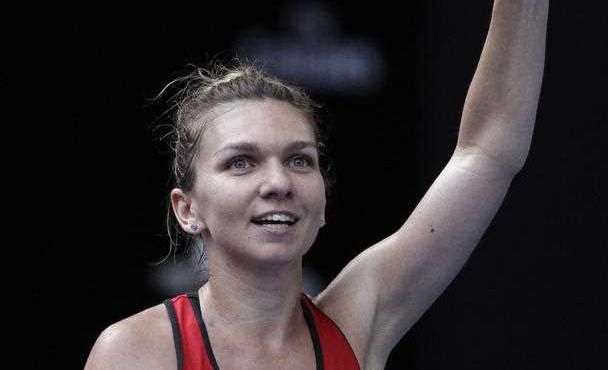 THERE'LL be something very different about Simona Halep compared to Caroline Wozniacki when they face off in the Australian Open final on Saturday night. We're not talking about Wozniacki boasting a near-10cm height advantage over Halep, or the Dane's blonde hair contrasting with the Romanian's slightly darker locks. Wozniacki will walk out on Rod Laver Arena with the logo of apparel giant Adidas on her dress and visor. That's what you do when a company pays you bucketloads of money to promote its brand. But look closely at Halep's outfit when she emerges from the tunnel onto centre court. Scour the red dress she's worn all tournament and you won't find a single sign of any sponsorship emblem on the fabric. That's because the tournament's top seed, who has spent the past 16 weeks atop the WTA rankings as the No. 1 player in the world, played in two grand slam finals and won 16 career titles, doesn't have a sponsor. Apparently being the best player on the planet doesn't guarantee you fat endorsement deals. It's why, early on in her epic three-set semi-final win over Angelique Kerber on Thursday, Halep wore a black visor with the Australian Open logo on it. The same visor can be picked up at the Melbourne Park gift shop. But why is someone within one victory of claiming a grand slam title going plain in the fashion stakes at one of the four biggest tournaments of the year? Halep was sponsored by Adidas for four years, but that partnership came to an end before the start of 2018. Tennis.life reported Halep's team wanted a deal worth more than Adidas was prepared to offer. When her people went in search of more lucrative offers but came up empty-handed, they returned to Adidas to renegotiate, but the company had already allocated its sponsorship budget, the website reports. It's why Halep has worn a simple red dress at Melbourne Park after first donning it at the Shenzhen Open earlier this month. That red dress garnered plenty of attention as Halep spoke to reporters at the Australian Open media day before the first major of 2018 got underway. "Yeah, my people are working for me on this stuff. They are talking. But the conversation has just begun. I have no contract now. I'm still with no brand clothes," Halep said before her first round match. "I just want to make sure that I will choose what I like - and also the brand to like me. It's really important to have a nice outfit and to feel good in the clothes. So I'm not rushing. I will wait (to see) what (the) future gives me." Halep told the pack of journalists just how she got her hands on the dress that's helped carry her all the way to the decider in the Victorian capital. Apparently she took to the internet to find a design she liked, then ordered it from a seamstress in China. Twenty-four hours later, it was in her hands. "Everything is on internet now," a smiling Halep told reporters. "I was a little bit stressed. "I chose the model. But it's plain, come on. Nothing special there. It looks good, in my opinion. I like it." And why not stick with it? Halep won the singles and doubles titles in Shenzhen while wearing the dress and, come Saturday, she may be celebrating again in front of a boisterous Melbourne crowd.